Sketch for "Columbia", Oil on Canvas, 20" X 24"
Mark P. Fisher was born May 12, 1955 in New Orleans, Louisiana. In 1967, At Phillips Exeter Academy in New Hampshire, Mark discovered the theater, music and the Fine Arts, particularly sculpture. 1982 saw the creation of Mark's first cartoons, which emerged in the edges of letters he wrote to students. 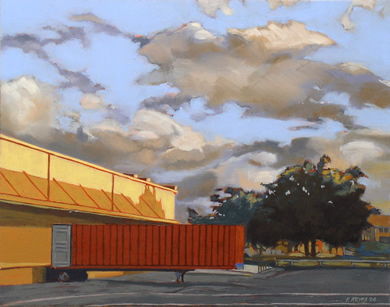 In 1988, Mark began training in Old Masters painting techniques at The School of Classical Realism in Oakland which provided him with strong fundamentals in drawing and painting. 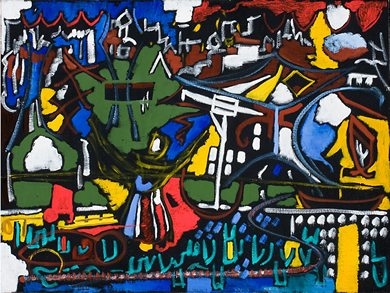 Mark first solo show (FRAUD, and Other Paintings) took place in 1991 in Berkeley at Turn of the Century Fine Arts. Since then, two other solo shows have been held, the last one being "Love For Sale" in 2004. 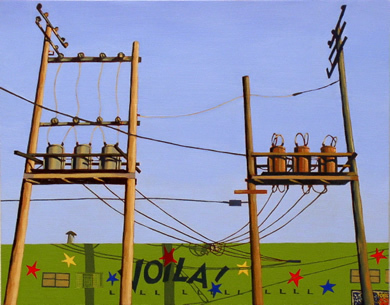 His work has been called eclectic and whimsical. 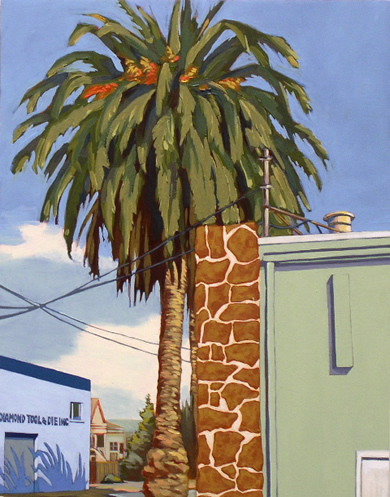 These paintings are all images from Reyes' neighborhood where his studio is located, "Jingletown", in the Fruitvale district of Oakland. 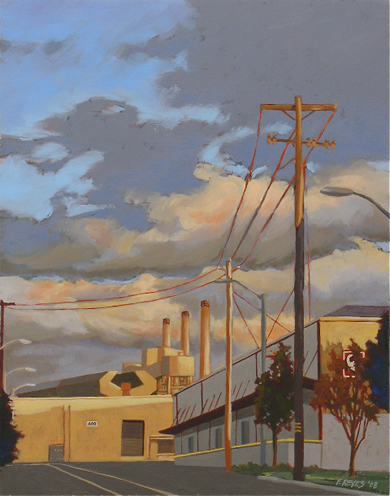 Each painting shows the charm of an enclave that reflects the character of a neighborhood where artists, small businesses, blue collar and middle to upper middle class reside in harmony. Reyes purposely decided to document older buildings that reflect the past and now present of Jingletown. Art is a second career for Fernando, who spent 17 years in banking in San Francisco. He began as a self-taught artist, then decided to seek formal art education at the School of the Art Institute of Chicago. He received his BFA there in 1997. He then returned to the Bay Area and has lived in Oakland since 1998. Fernando works in his studio located in the Jingletown neighborhood in Oakland at the Ford Street Studios. Throughout the years, Fernando has produced a large and diverse portfolio of artwork. His work is primarily representational and includes oil paintings, charcoal & conte drawings, and printmaking. Subjects include figurative nudes, landscape and urban scapes. His primary interest is in depicting the human figure. These works have captured the attention of collectors throughout the region, nationally and internationally. Mixed Media, 9 " x 6 " SOLD! These pieces are part of new series of small, mixed media originals that takes it back to the street. 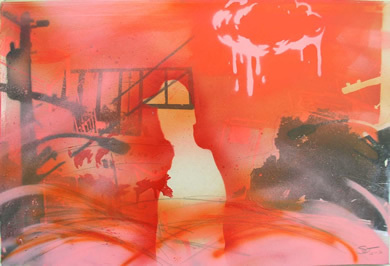 The series is inspired by Courtenay-Smith's project with the East Bay Express, which had him using a spray can for the first time in about 20 years. He used spray paint, house paint, acrylic and photo transfers on dry wall to make these. The dry wall is backed and framed with plywood. The idea was to work faster than he normally would to try to capture the sublime immediacy of drawing and graffiti art. He has been invited to show at the Florence Biennale in December 2009! 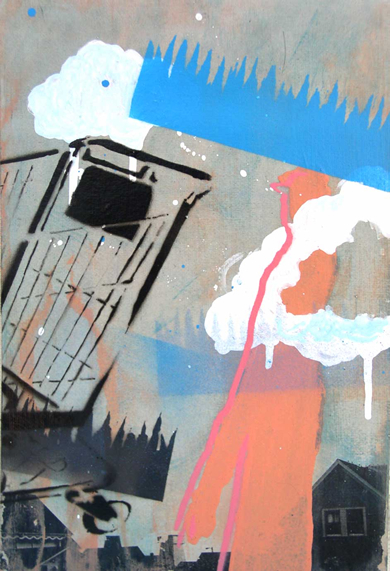 City Blood/ Country Blood, Oil, 8" x 6" SOLD! Scott grew up partially in the Appalachian mountains of Kentucky and partially in rural New York State. Since then he has lived in nearly 10 different cities, including London, Alburquerque and New Orleans. He studied painting, drawing and printmaking at Syracuse University.